A couple weeks ago, I met up with my brother in San Francisco for the weekend. I had been meaning to visit SF for a very long time and the city fell nothing short of my expectations. Not surprisingly, I instantly fell in love with the place, its architecture, diversity, dynamism, and of course its food. In short, everything about SF was incredible (except the steep prices)! As firm believers that one can learn a lot about a place through food, my brother and I set out to sample some of San Francisco’s finest over the weekend. It always amazes me how much you can discover that way! We tasted Californian cuisine at its best: fresh, bright, “fusiony” seasonal creations a plenty! All of which we perfectly experienced at a place called the Prospect on Fillmore Street. This restaurant was one of the typical unexpected discoveries that happen when travelling. We stumbled upon it after being turned down by its ever-full “sister restaurant”, State Bird Provisions, for lack of room. The wait list was about 3 hours and we were both too hungry for that, after hiking around the Golden Gate and Baker Beach all afternoon. Luckily, The Prospect is right next door and after peeking in, we decided to give it a shot. What an absolutely incredible dining experience! Bright, creative dishes, bursting with flavors and colors, one after the other. We had charred octopus, super fresh homemade ricotta and citrus, some homemade pasta with bone marrow and spring peas… and many others. It was all but a dream! Although we were too full beyond reason, we even managed to finish a delicious slice of olive oil cake with airy whipped cream to its last crumb. I digress, but this is the kind of experience that truly highlights the best of seasonal cooking and further confirmed my love for this industry. Another highlight of my trip happened on my first day. After hitting up Blue Bottle Coffee (classic) for breakfast, I headed straight to the Ferry Building Marketplace to explore all of its stands one by one. I had heard about this place beforehand and originally went there aiming to buy beans at Rancho Gordo (more on that later) and cheese at CowGirl Creamery. Fortunately, I also happened to stumble upon the StoneHouse California Olive Oil stand while browsing through the aisles. They were sampling a bunch of varieties of their olive oil and I couldn’t resist but try some of them. Little did I know that this sampling would turn into a revelation! These olive oils tasted like nothing I had had before. One after the other, they showcased deep aromas and complex flavors. I had no choice but to bring some home! 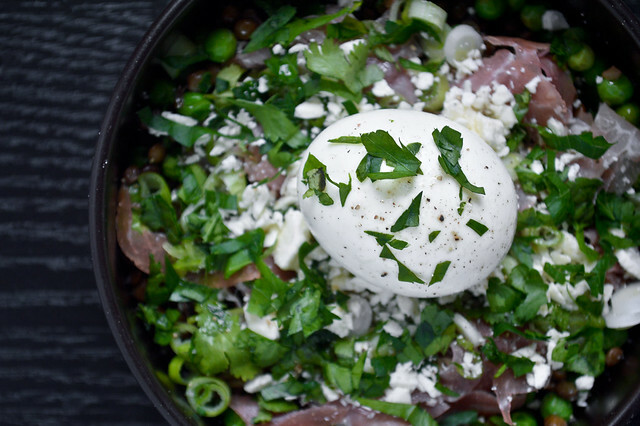 This spring salad truly highlights the rich flavor of StoneHouse’s Meyer-Lemon olive oil. The store representative and I talked for a while, and I found out the depth of their oil’s flavor actually comes from the way they press/extract it. Instead of infusing the oil after the fact, like most places do, they actually press the aromatics at the same time. That’s also why their basil oil is so powerful! 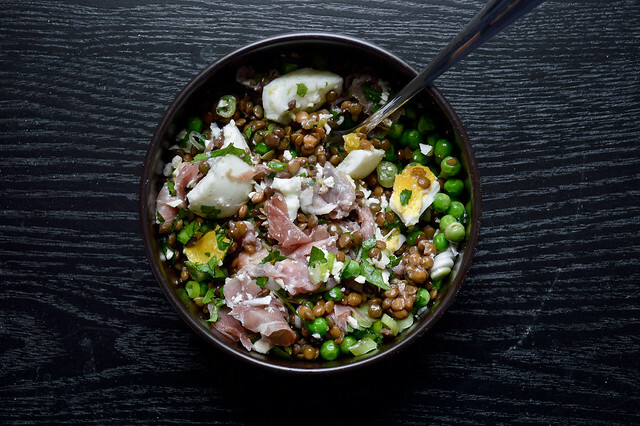 This lemony one is perfect with English peas and prosciutto, and it truly brightens up the lentils deliciously. It’s a really tasty, fresh but somewhat hearty springtime lunch that’ll leave you grateful for spring produce. Bon appétit! Meanwhile, prepare the rest of the dish. Mince the spring onion and chop the cilantro. Roughly cut/tear the prosciutto slices into smaller pieces. 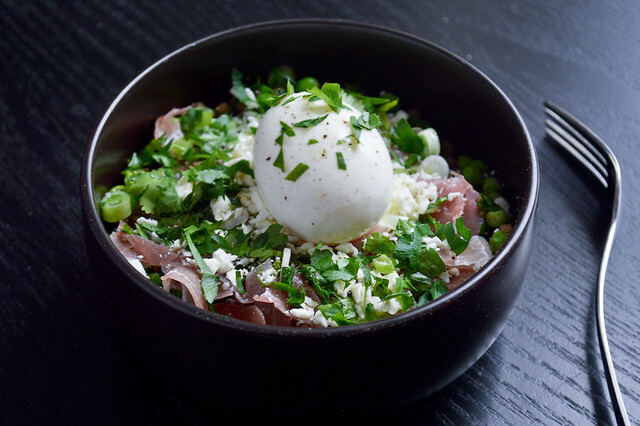 Cook the egg for 7:00min and transfer it to a bowl full of ice water to stop the cooking process. Next, put the English peas in a bowl and microwave them for 2 min (or boil them if you prefer). 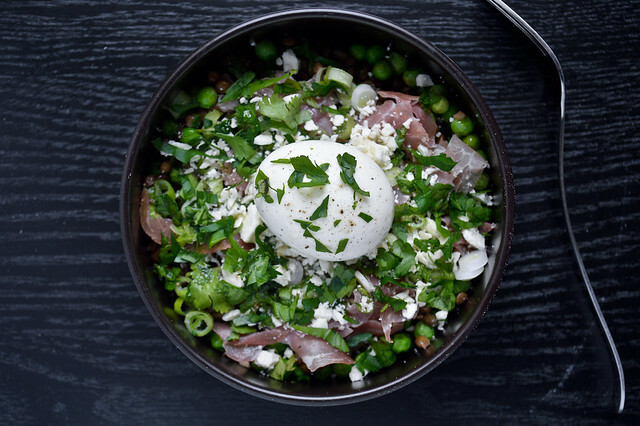 In a bowl, add the pre-cooked lentils, English peas, and prosciutto strips. 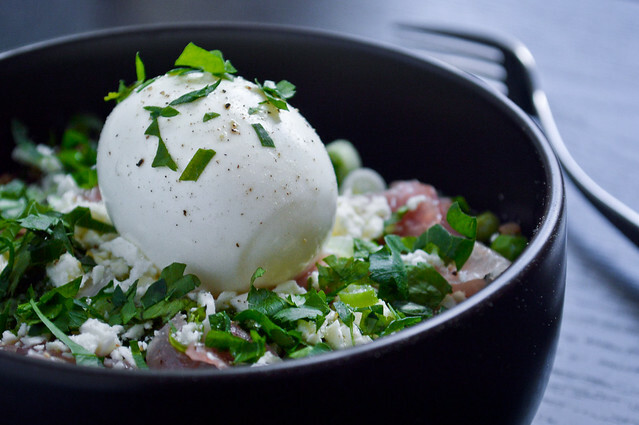 Top with the minced onion, chopped cilantro, crumbled feta and peeled soft-boiled egg. Drizzle with Meyer lemon oil (or olive oil and a squeeze of lemon), and adjust the seasoning with flaky sea salt and freshly ground black pepper. Enjoy! Faites bouillir de l’eau dans une petite casserole. Pendant ce temps, préparez les autres ingrédients. Emincez l’oignon vert finement, ainsi que la coriandre. Déchirez les tranches de jambon en petits morceaux. Faites cuire l’oeuf pendant 7:00min et transférez-le dans un bol d’eau glacée pour arrêter la cuisson. Profitez-en pour mettre les petits pois au micro-ondes pendant 2 min (vous pouvez aussi les faire bouillir). 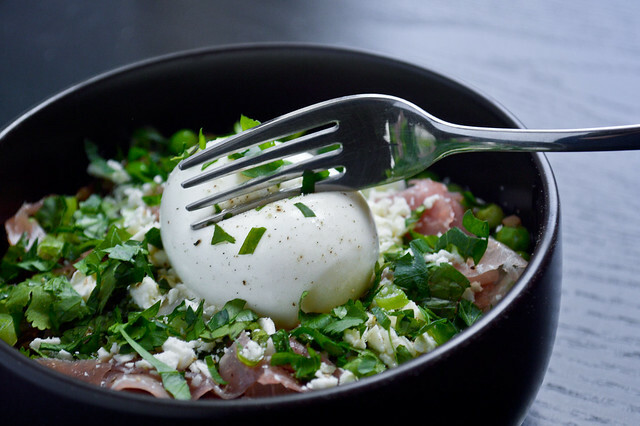 Dans un bol, ajoutez les lentilles pré-cuites, les petits pois et le jambon. Garnissez avec l’oignon émincé, la coriandre, la feta et l’oeuf mi-cuit. Assaisonnez d’un bon filet d’huile d’olive parfumé au citron (ou huile d’olive + un peu de jus de citron), de flocons de sel et de poivre noir fraichement moulu. Bon appétit! 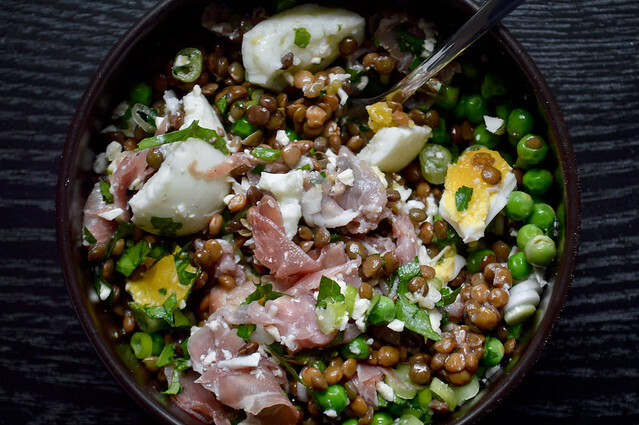 Posted on May 2, 2016 by julieadPosted in Dinner, Fridge Friday, Lunch, Main, Recipes, SaladsTagged delicious, english peas, lemon, lentils, light, lunch, prosciutto, salad, san francisco, season, soft boiled egg, spring, spring onion, vegetarian. This looks really good. I’m going to have to try this over the weekend (: Thanks! Oh my goodness- sounds divine. As does your trip to SF. Excellent recipe!Congratulations! I tried it myself now!